The AltWallet is exactly that, what the name is suggest. A plugin to help you managing your alts' wallet. This plugin is extremly useful with Premium wallet! I am strongly recommend to buy it, premium wallet is the best TP investment ever. Check the second picture, how many items moving inside the wallet from your bank/bag! Nearly all bounded barter item (festival- area- crafting- taxidermist barter tokens)! Can show the character bound items from wallet, the money (each one and summa), and the account bound items as well. It's can run an alt-wide search for any wallet item! Toggle visible / hide from desktop icon. 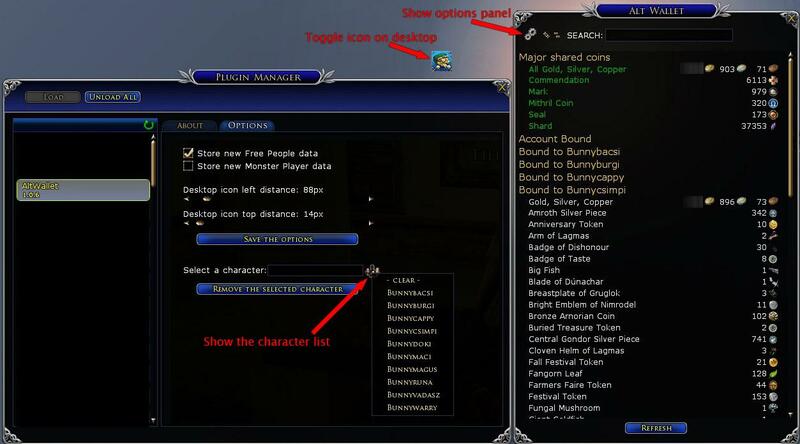 You can remove any character data from options panel. Unzip the downloaded file to The Lord of the Rings Online/Plugins folder under your Documents folder. I am strongly recommend to delete the old version before you copy the new one. Delete the AltWallet folder under the Bunny. For moving the desktop icon, hold the Ctrl key and drag it with mouse or use sliders in the options. For storing the character informations you must login with each one and load the AltWallet plugin. Open the options panel use the Plugin Manager or gear wheel button on the panel. hint: If you want to see only the money of all character, use gold, search text (yes, with comma). Select "Load all character" in the Plugin Manager for this plugin to keep update the stored informations. Does not refresh the actual character wallet information in realtime. But it is refreshing when the AltWallet windows show, when you logging in or out and if you use the [Refresh] button or command. So this is problem only if you keep open the plugin meanwhile doing something that is change the wallet. The reason why this two limitations above, because I like to saving the game resources. The turbine does not give you event for wallet change. So you must compare all your item's quantity yourself from plugin periodicly, that is using resources. Same reason with the tooltip, I do not want to waste resource for hundreds mouse event for a not important function. Maybe I am too conservative programmer, who know. But I like to write my programs as lightweight (and fast) as possible. 1.0.6 - Set the desktop icon position from options with sliders. 1.0.4 - Star of Merit in the majors, different icon when icon is moveable. 1.0.1 - Plugin compendium support, bugfix. I try to reconsture your problem, but I cannot. Hold the ctrl then click to the icon and move it with mouse. Of course you must hold the main mouse button during you moving. Last edited by bunny : 01-12-2015 at 05:02 PM. I too, cannot move the Icon when holding the CTRL Key. Also, I can't find in ...\plugindata where the location is saved. Please provide more info. ok, 2nd take. I unloaded altwallet and exited the game. I then deleted Bunny directory from my lotro plugins. reinstalled 1.0.5 and restarted game. I still can't move the icon with the ctrl/mouse click/drag (BTW) I also have this problem with altinventory. But, the BnyAltWalletOptions.plugindata file is now in my character directory and it does show the icon location. I will manually edit it for know. Once I have the right location, I'll do it for all my characters. Last edited by Rrys : 01-26-2015 at 10:34 AM. Ok, I've fully implemented on all characters on my main account! I love it. What a useful plugin. Just being able to see all the gold is marvelous! 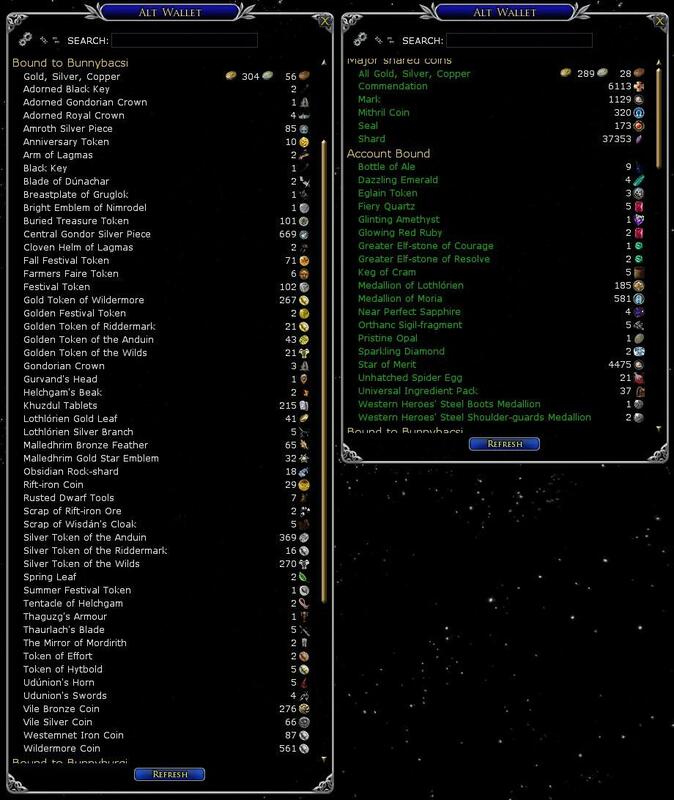 About the data files, there is one in your character directory and one in the server all character directory, because some information need to share and some not. About the icon moving. None of my kinmates have ever problem with the icon moving, and as you said some other plugin like the AltInventory use the same method. But a small hint, when you doing right you can see the icon changing. 'hope it will help a bit, try, and when you catch it you will love it, I promise! Last edited by bunny : 01-26-2015 at 06:18 PM. Wow I hope it will help everyone else, too! But for make sure everybody happy I am integrated two slider to the option panel, so you can set the desktop icon position from opcions. I hope it will be solve the icon moving problem finally. Just download the 1.0.6! Last edited by bunny : 01-27-2015 at 08:29 AM. 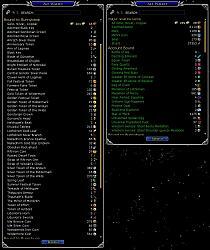 Remind me please: Where is and/or what is the lotro cache file's filename? I wish I had found this plugin earlier, it's very helpful! Have a look in C:\Windows\Prefretch (you may need to enable Folder Options -> Show Hidden Files, and untick the Hide files options). If you see a lotroclient.exe or turbineclientlauncher.exe file (probably with a GUID after it), remove this and try again. This is a prefretch database file and will be rebuilt. Bunny, I sent you a PM. Could you read it and reply to it? when I clear my screen with F12 to take a screen shot the icon still remains. Thanks, I will looking after what can I do!